Meerkat (Suricata suricatta) - Mongoose family. Member of Mongoose family, Meerkats forage in a group with one "sentry" on guard watching for predators while the others search for food. Sentry duty is usually approximately an hour long. He's adorable and funny, great capture. got to love this little one.....good eye harsh! Fun catch of this interesting creature! Standing guard, eh?! Neat catch! Boy is he sitting straight! Really interesting line coming off the logs. super capture! 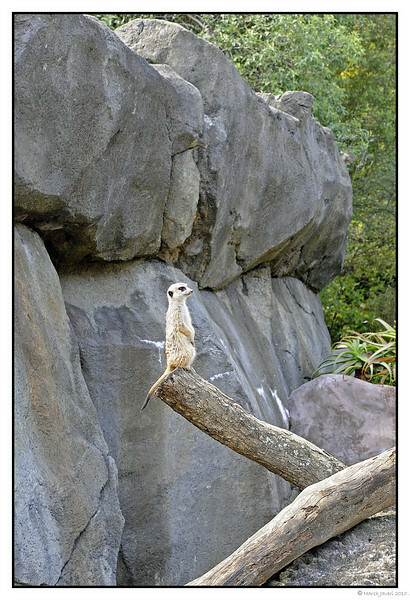 I love meerkats they are so cool! Such funny little creatures! Great capture!